At this time of year a large focus of our office time shifts from camper recruitment to staff hiring. We are literally scouring the globe to find the right people to join the Runoia summer team. Being a camp counselor is never dull! Hiring staff who will fit into our camp family is crucial. Our returning staff are usually quick to sign back up and then long time camp staffers find us if they are looking for a change from their previous camp. 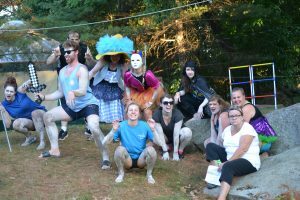 Campers from years gone by often reappear on our radar as they enter the college years and find themselves with a summer available to make a return to Great Pond. Positions quickly fill up as friends and alums also tell people about the opportunities available at Camp Runoia. Our primary goal with hiring staff is to find the right people for our community. We want them to get to Runoia and feel like they have arrived at their summer home where they fit into the ‘family’. In our experience being happy and content produces peoples best work so having a philosophical alignment with Runoia is essential. Staff having a true passion for working and living with children is crucial; we can easily teach people the policies, procedures and systems. Finding caring young adults that are willing to share their skills with our girls is our focus. Most of our staff are college age students both from the US and overseas. Many are on a focused career track and are seeking to gain more experience working with children. Camp also provides the opportunity for a new adventure and to see a different part of the world. 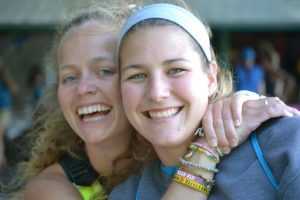 The connections counselors make with their campers and peers are often long lasting and have great value. For those that have never attended camp spending a summer in the woods of Maine without their technology can be a harder sell. It is often a challenge to convince students (and their college tuition paying parents!) that camp can provide them with the opportunity to continue developing and honing their 21st century skills. Often colleges are pushing career related internships and work experience that will be a resume builder. It may come as a surprise to find out that camps are often more than happy to accommodate internships and also provide an array of transferable skills that are attractive to employers. Along with hard skills there is a great deal of holistic development gained from a summer at camp. We are happy to help translate these skills developed at camp into tangible resume language Translating-Camp-Employment-To-Your-Resume.